Among them we can find hard workers, inventors, managers and geniuses who have played significant roles to enhance the equality movement, and who have guided humanity towards adopting new values. The Iranian Resistance’s experience, however, is unique due to its persistence and extent. The women who are introduced by the NCRI Women’s Committee website, each represent a different angle to the 50-year experience of this movement. Some of them are women who poured into the streets in the hope of establishing freedom in Iran after the Shah’s overthrow. However, Khomeini isolated and subjugated them from the onset of his rule. A number of them are women who stood against Khomeini and his heirs, enduring bitter experiences of imprisonment and torture, and ruthless massacre of their loved ones. Some are young women who felt the meaning of humiliation and crackdown as soon as they opened their eyes to this world; while others are the children of families forced to leave Iran following the 1979 anti-monarchic revolution and take refuge in Western countries. Let us also not forget the heroism of all the mothers who, along with their children, chose to resist against barbarity of fundamentalism, as well as others including young women who chose to forsake their homes and families and endure incredible hardships for a greater love, the love of liberating their beloved homeland, Iran. Their names and appearances vary but they embody the same spirit and strive for a united cause in their quest for freedom and equality. They are the “Force for Change” and the answer to fundamentalism whose barbarism has surpassed all frontiers to engulf the entire world. None of the women introduced in this page thinks she is special or should stand out from others. None of them depends on family reputation or social prestige. They gain their confidence and credibility from what they do together and from sacrificing for each other and for their people. Contrary to the usual approach, these women are not valued for their beauty, age or personal talents but by the beauty of their souls and their love for their fellow human beings. Being prepared to forego their own interests and sacrifice for others, to accept responsibility in the path of freedom with all the risks that come with it, to respect others, to be reliable and dependable when others are in need to count on somebody. Their power, productivity and efficiency comes not from their personal motivation or creativity, but from their team work. 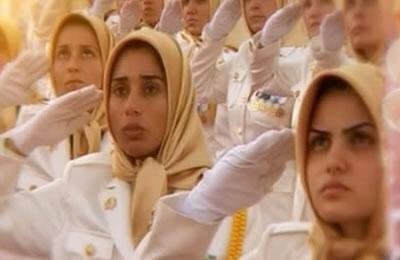 This generation of women who are rightly the pioneers of the Iranian people’s liberation movement, have come into being thanks to an emancipating vision that can make heroes out of every human being and show them that they are capable of doing anything they need to do. This vision was first presented to the Iranian Resistance by its standard-bearer Maryam Rajavi. These women present a battle-tested model that has risen to counter the outdated standards dictated to women over centuries. They have made fundamental changes to the patriarchal structure, promising a bright future for humanity. This generation of women has risen today as the main adversary to religious fundamentalism that has traversed the entire region and its roots come from Tehran’s regime. However, there is no doubt that this hate-filled ideology will find its final response in the force of these very women.